A Scene From Danny's Lifelong Appreciation of Vincent Price: It is the late 1980s, and my dad has brought home a video for the family to watch one Friday night. That movie is The Whales of August, the story of two veeeery elderly sisters (played by Bette Davis and Lillian Gish) who reminisce about their lives while spending the summer at their beach house. Vincent Price plays their neighbor, a deposed member of the Russian nobility. The movie is exactly as exciting as I have just made it sound, especially to a houseful of children all younger than 13. However, it is responsible for a line that gets jokingly repeated around our house for the next several years, shouting in a shaky, elderly Bette Davis voice, "NO! You may NOT come into my HOUSE and have a cup of TEA!" That's probably a lot funnier if you were there, or at least if you've seen The Whales of August. This isn't a flawless movie. The acting in it is pretty hammy, and you'll be able to solve its central mystery about halfway through if you're paying attention. Also, I wouldn't strictly call it a horror movie as much as a thriller. What really worked for me, though, is that the whole movie acts as a showcase for Vincent Price. 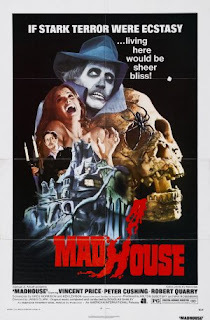 By 1974, when Madhouse was released, Price had been in Hollywood for nearly 40 years. Although he continued acting right up until his death, and even had a few more notable roles, it's safe to say that by this point in his career he was mostly out of the spotlight. This movie is filled with allusions to his earlier work, including many clips of his films, which are tied into Madhouse as excerpts of his character's movies. I even caught a few seconds of The Masque of the Red Death in one scene! His best friend is played by Peter Cushing, another legend of classic horror, and the scenes between the two of them are lots of fun to watch. I give Madhouse three film reels out of five. Tomorrow night: House on Haunted Hill, available on Netflix instant streaming.